Affordable houses for low-income earners and state workers will go on sale within two weeks after a groundbreaking ceremony on Saturday. The project, aimed at the lower middle class, low-income earners and state workers, will be restricted at first to low-income civil servants, said building contractor WorldBridge Land. WorldBridge Land chairman Sear Rithy said that the company will follow the directions of the ministry but said the cost of a housing unit would range from $25,000 to $30,000. “Finance for buyers is the responsibility of the company and we will allow sales only to couples with an income below $500 per month,” he said. The project will be about 18 kilometers from the capital in Saang district, Kandal province and about eight kilometers from the Takhmao roundabout. WorldBridge Land’s initial investment in the project was about $60 million,” Mr. Rithy said. Private company staff would also be able to buy the homes by giving details of their salary, but they must be a couple. Mr. Rithy said that the company and the Ministry of Urban Planning will thoroughly check the purchasing applications before allowing people to book a place on the project. This would make sure that they are homeless and have a low income. They would have to move in after construction by the end of 2018. Buyers would not be able to sell or rent out the home for five years. Mr. Rithy was not able to say what the down payment would be but the company was trying to make it as low as possible. The company was also working with the banks to make repayments acceptable. Mr. Rithy has asked the government to consider exemptions on taxes for importing material and machinery for the construction, to exempt the taxes on profit and other value-added taxes, real estate taxes, and taxes of transferring property to customers. Moreover, he said the government has to make sure that the infrastructure, including electricity, water supply, roads and the telecommunication network must be connected to the development site. “This would help to reduce the cost of construction and contribute much to boost the living standard of the civil servants, soldiers, lower middle classes and low-income earners. This will allow them to have proper dignity in a decent home,” Mr. Rithy said. Urban Planning Minister Chea Sophara said that Cambodian people could not make repayments of more than $80 per month to the bank. He said that this project must adhere to quality standards, with roads, electricity and water supply connected and there must be at least five percent green area within the project. “We are asking the provincial authority, local authority and other relevant stakeholders to faciliate the infrastructure services to encourage the company to complete the construction quickly,” Mr. Sophara said. Kheng Kim Soeun, an officer in the identity department of Kandal provincial authority, said that he supported this project since it was affordable housing and it would be perfect if he could buy a home. He hoped to have a proper house after he retires from work. WordBridge Land says homes on the project cover 24 hectares of land out of a total 45 hectares which include shops, a clinic, a school, an administration office, a park and office space. There are 2,297 units priced from $25,000 to $30,000, with a choice of two kinds of houses. This first group of 2,025 units is four by seven meters with two storeys, and includes two bedrooms and one bathroom. The second group of 272 units is six by seven meters including three bedrooms, three bathrooms and two storeys. Each has 1.5 meters of ground at the front and two meters behind the house. The project will be completed by end of 2018 and the company will build another project near Phnom Penh. 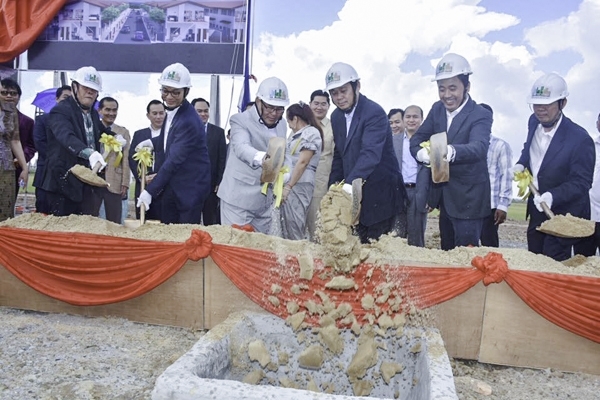 Chrek Soknim, CEO of Century 21 Mekong, recently welcomed WorldBridge’s public housing project, saying it was suitable for Cambodia which still had many poor people who could not afford decent housing. “Such a project would also help the poor to be able to afford to live in Phnom Penh,” he said. Mr. Soknim said for the project to be a success, it must have strong support from the government. According to the Ministry of Land Management, Urban Planning and Construction, the demand for housing for Cambodia will be one million units in 2030, of which the demand in the capital will be about 52,000 units.